Open Monday to Saturday 9am to 6pm. Open Sunday 11am to 4pm. Closed on Bank Holiday Mondays, Easter Sunday, Christmas Day, Boxing Day and New Year’s Day. 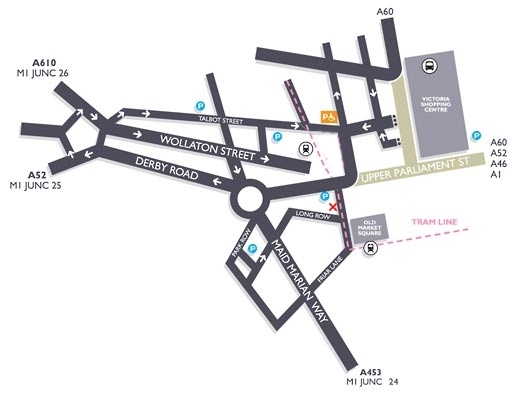 It’s very easy to find Page 45: we’re right in the centre of town, opposite Debenhams, just off the open Market Square and its huge, white, domed classical building. If you’re coming by train, turn right out of the train station and keep going in the same direction all the way! Walk over the canal and across a couple of roads, whereupon you’ll see the entrance to the Broadmarsh Centre. Stroll straight on through the Broadmarsh Centre and out the other side, then carry on to the Market Square and follow the tram tracks straight up to Market Street. We’re a few doors up on the left-hand side, opposite Debenhams. If ever in doubt, make sure we’re on your mobile, give us a call and we’ll work out where in the city you are and guide you towards us. Enter the shop, swoon at the comicbook heavenry, and then hold on tight to your wallet!